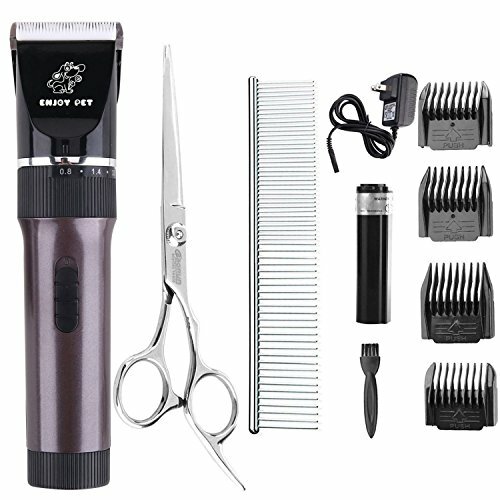 Giving your dog a perfect look with the ENJOY PET hair grooming clipper kit. With premium copper spindle and 15W motor power, this pet hair clippers have good wear resistance, fast heat dissipation, good sharpness and sound stability, which will not snag or pull. Compared with ordinary steel or 24 teeth Ceramic Blade, ours 33 teeth Titanium Ceramic Blade is more sharp, durable and efficient for cutting through thick hair. It helps get rid of unwanted hair and leaves your animal with a neat, groomed look. Mute is not no noise, in order to achieve ultra-quiet, some sellers stall small motor. But it is easily clogged. Our ENJOY PET clipper combines low noise with powerful motor. The noise is lighter one in the same powerful motor of the hair clipper. It will not hurt your pet no matter what angle. And after testing, pinching the fast swing blade is not hurt the finger. Due to transport restrictions, our oil is not included in the kit. Thank you for your understand. Ultra-High Capacity: Built-in 2000mAh Li-battery. Last for 7 hours working after 3 hours fully charged, longer than other ordinary pet grooming clippers over 6 times. Long battery life, charged over 500 times. Powerful Motors & No Clogged: 3.7V, 15W motor power. Up to 9,000 revolutions per minute, providing amazing power without hair clogged. 33 Teeth Sharp Blade: Compared to other 24 teeth of the blade, our 33 teeth sharp blade is the best for hairy, thick or soft hair dogs, cats or rabbits. If you have any questions about this product by ENJOY PET, contact us by completing and submitting the form below. If you are looking for a specif part number, please include it with your message.